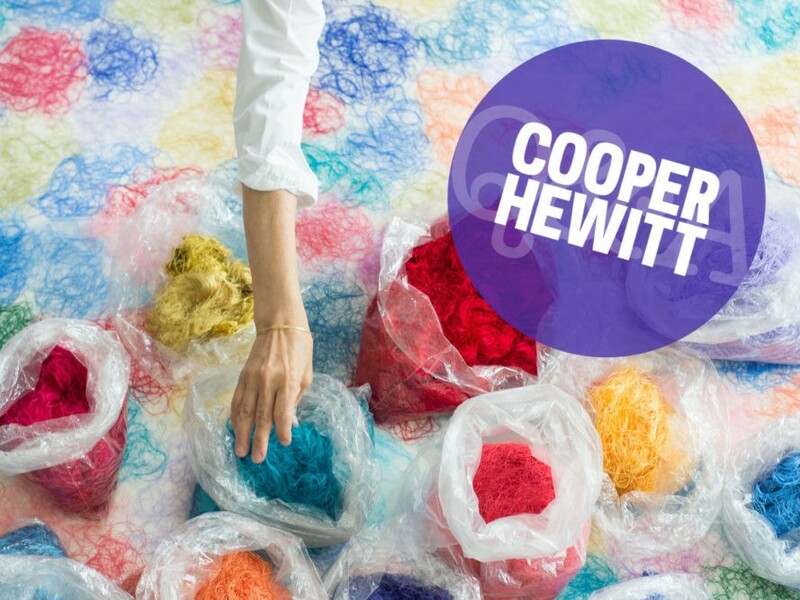 Scraps: Fashion, Textiles, and Creative Reuse, currently on view at the Cooper Hewitt, Smithsonian Design Museum in New York City, is something of a Rorschach test for our relationship with stuff. Taken at face value, the exhibit highlights the myriad ways we can artfully give leftover fabrics a second lease on life. Dig deeper, however, and you might strike an unexpected vein of criticism, one that casts a gimlet eye at the 310,000 truckloads of clothing that Americans throw away each year. Featuring the work of Milan’s Luisa Cevese, Los Angeles’s Christina Kim, and Tokyo’s Reiko Sudo, Scraps seeks not to hector but to educate, illuminate, and perhaps even inspire. Ecouterre caught up with Susan Brown, associate curator of textiles, and Matilda McQuaid, deputy curatorial director and head of textiles, to get the behind-the-scenes scoop on the exhibit, their opinion of the “fast fashion” phenomenon, and just what America can do about its textile-waste—both pre- and post-consumer—problem. What inspired the theme of the exhibit? The growing concern about issues associated with fast fashion and overconsumption have been in the news quite a bit lately, so most people are at least familiar with the problem of post-consumer waste—the clothes and household textiles that they, as individuals, throw away. But pre-consumer waste, which is generated during the process of manufacturing consumer goods, is estimated to be 40 times that amount. But those processes—fiber production, spinning, weaving and knitting, apparel production—are fairly invisible to most people. How did you choose the three designers you’re featuring? Was everyone on board immediately or were there challenges? Last year, the museum acquired one of Christina Kim’s recycled jamdani panels for the textiles collection. In talking with her about the jamdani project, it became apparent that it had transformed her design process and the way she runs her business. That is very relevant for a design museum. By analyzing one designer’s very thoughtful and thorough reconsideration of the way she works, we could see how this topic could be developed into a very important exhibition, as well as a beautiful one. Reiko Sudo’s kibiso textiles are also in the museum’s collection. 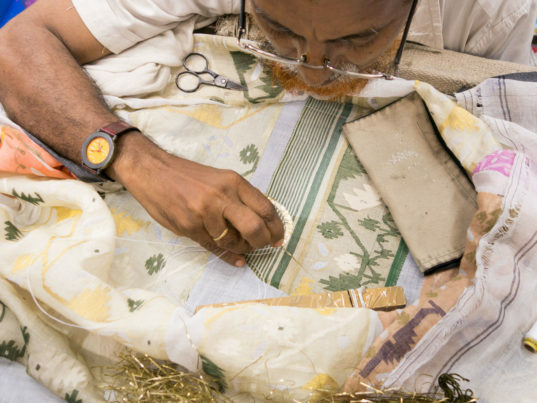 In fact, the museum has been collecting her work since the 1980s, so we were aware of her long-term commitment to reuse and recycling, which has been manifest in so many beautiful Nuno textiles. By adding Luisa Cevese’s work, we were able to look at design using waste generated at three different stages of the fashion chain—fiber production, textile production, and apparel production. All three designers were very happy to have their work presented in the context of sustainability, and to have their work shown together. They have known and admired each other’s work for many years and also worked together on projects so it made sense to present them. There are certainly other designers working with similar sustainable concerns, but we wanted to tell a thorough story of each designer’s project, which meant limiting the number of designers. We’re in a period of peak consumption, particularly when it comes to apparel and textiles. Does Scraps have a specific point of view regarding this? First and foremost, Scraps hopes to inform consumers about the choices they make when purchasing clothing. Textiles and apparel have one of the most complex production chains in all of manufacturing, and there are opportunities for waste at every step. New York is also full of young designers and design students, many of whom are deeply interested in sustainability. The problem can seem overwhelming, so by showing the very beautiful work of three very committed recyclers, we hope to inspire them to thing about their work holistically. What are some of your favorite pieces from the exhibit and why? One of our favorite pieces is Reiko Sudo’s Tsugihagi. Piecing together fabric scraps to make new cloth is a very old idea, but made contemporary through the use of modern machinery and a little bit of chemistry. We like that the scraps in Scraps are very apparent, both visible in the finished product and celebrated as integral to the beauty of the piece. And Christina Kim’s amulets are so humble yet so precious. They really embody her “every last scrap” philosophy. 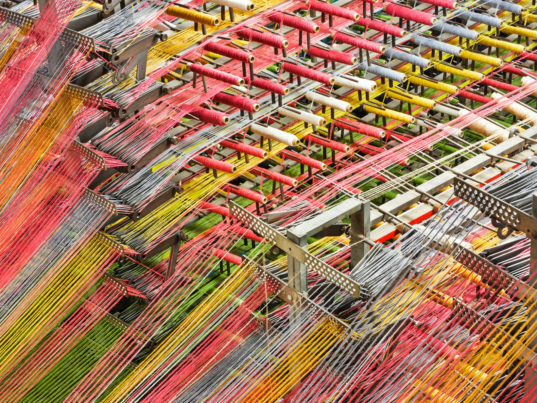 As we develop innovations in textile-recycling techniques, how important is it for us to continue to look to crafting traditions of the past? Is there a place for them in today’s world of excess and disposability? We are in a state of poverty and necessity, with limited natural resources and a need to alter our consumption patterns to address global climate and environmental crises. This exhibition calls attention to work that resonates with very traditional crafts, like Christina Kim’s patchwork and appliqué garments, which have the double value of diverting materials from landfill and sustaining traditional handicrafts by providing skilled labor. But 19th century industrial techniques, like creating regenerated fiber from discarded wool garments, are also getting a second look. What are your views on fast fashion and the way it’s shaped the way we consume textiles today? There are many aspects to the fast fashion problem. One is sheer overconsumption. Over 20 million pounds of discarded clothing goes into U.S. landfills every year, and still used clothing is our second largest export. The secondhand clothing we ship around the world is suppressing local production of textiles and apparel in the countries to which it is being shipped. Another is quality: the low-quality fibers and fabrics used in the production of cheap clothing means it has less value as secondhand clothing, and fewer options in terms of recycling. There are also environmental issues related to pesticide use, dyes and finishes, non-biodegradable petroleum-based fibers, and methane gas produced by the decomposition of textiles in landfill. And finally there are the human costs. We think the Rana Plaza factory collapse in Bangladesh was a turning point for our generation, just as the Triangle Shirtwaist Factory fire was a century ago. The human and environmental costs of overconsumption have become too obvious to ignore. 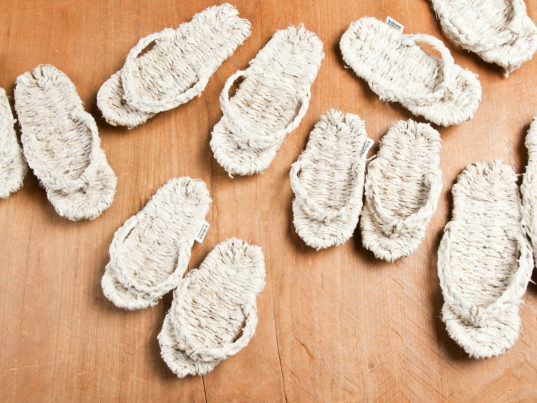 What can non-designers and regular consumers do to reduce textile waste in their lives? Maybe we should stop describing ourselves as consumers. We all need things, but we can be makers, fixers, and sharers of things, too. We can buy less, and care for and mend the things we have. We can buy vintage or thrift, or organize a clothing swap with our friends. When buying new, we should look for items that are recyclable, avoiding, for example, blended fibers, which are difficult or impossible to separate for recycling. And when we’re sure something is truly worn out, take advantage of textile and clothing recycling collection points. Scraps: Fashion, Textiles, and Creative Reuse, currently on view at the Cooper Hewitt, Smithsonian Design Museum in New York City, is something of a Rorschach test for our relationship with stuff. Taken at face value, the exhibit highlights the myriad ways we can artfully give leftover fabrics a second lease on life. Dig deeper, however, and you might strike an unexpected vein of criticism, one that casts a gimlet eye at the 310,000 truckloads of clothing that Americans throw away each year. Featuring the work of Milan's Luisa Cevese, Los Angeles's Christina Kim, and Tokyo's Reiko Sudo, Scraps seeks not to hector but to educate, illuminate, and perhaps even inspire. Ecouterre caught up with Susan Brown, associate curator of textiles, and Matilda McQuaid, deputy curatorial director and head of textiles, to get the behind-the-scenes scoop on the exhibit, their opinion of the "fast fashion" phenomenon, and just what America can do about its textile-waste�both pre- and post-consumer�problem.